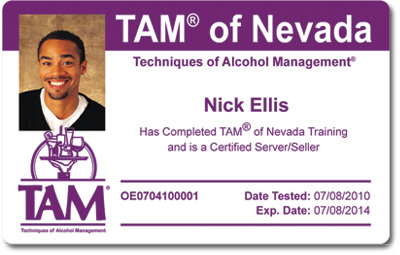 Introducing TAM of Nevada’s Refer-a-Friend Program – TAM Card® Nation in Vegas! Plus, those you refer receive 10% off the purchase price of their alcohol awareness class. It’s simple, it’s easy, and everyone gets rewarded! Visit us at the TAM of Nevada website to learn more about the program and get started. When you sign up, you’ll be given a personalized referral code to share with your friends and coworkers. For every person who uses your discount code when they sign up for an online or on-site class with TAM® of Nevada, you’ll be entered into a drawing for a $250 Visa gift card. There is NO LIMIT on the number of people you can refer or the number of times you can be entered to win. The more students you refer, the more chances you have to win! Share the rewards and benefits of a TAM® Card with your friends and coworkers and you can start reaping the rewards.